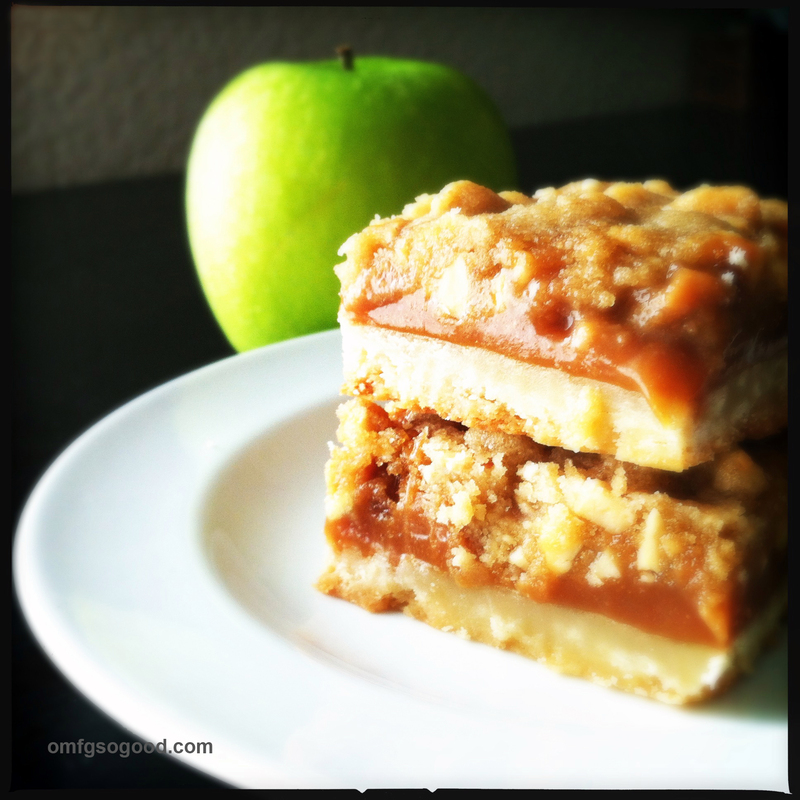 salted caramel apple bars | omfg. so good. Move over pumpkin spice, there’s another fall flavor in town. And his name is Salted Caramel Apple. I grew up in Upstate NY where apples are serious business. When I was a kid, every weekend during Fall, we would go to the local produce grower and load up bushel baskets with freshly picked McIntosh, Red and Golden Delicious, sample freshly pressed cider and DROOL over the hand-dipped caramel apples. Good old fashioned, tart Granny Smiths dipped in warm, gooey caramel then rolled in crushed salted peanuts. Nothing overly fancy about those bad-boys. But taking the first bite that broke the caramel seal was like heaven. It didn’t matter that they were sticky and messy, they were just plain delicious. 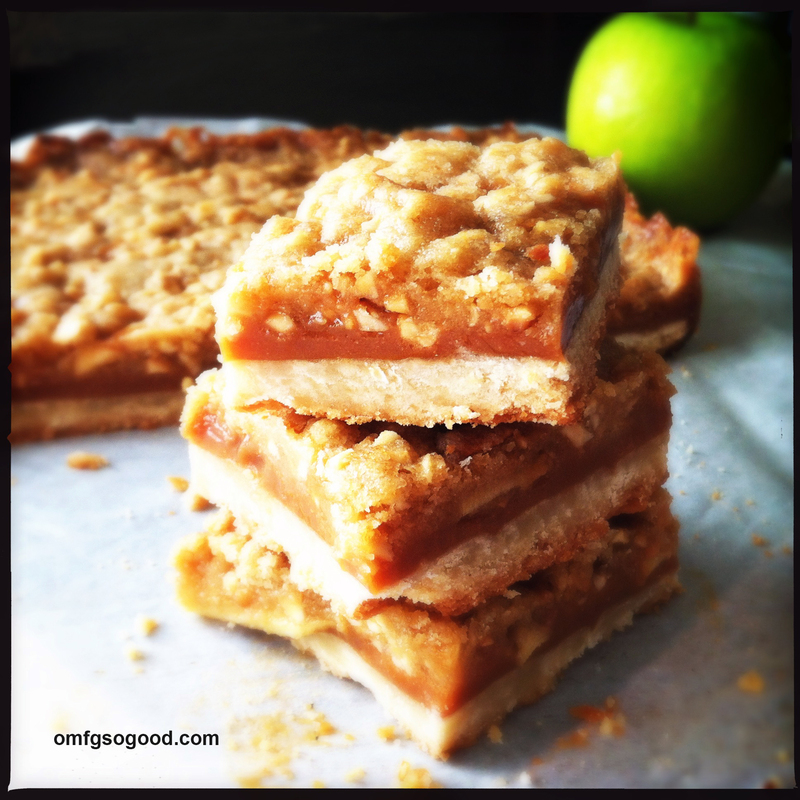 These caramel apple shortbread bars with crushed peanut crumb topping brought me back to that time and place. The only thing missing is the stick. Preheat oven to 300 degrees. Lightly spray a 9 x 13″ baking dish then line with parchment paper and set aside. In a medium mixing bowl beat the butter until free of lumps then slowly add powdered sugar. Mix until combined then add vanilla. Slowly add in flour and continue mixing. The dough will be crumbly at first, but will eventually come together to form a moist dough. Press the dough into the prepared pan then prick with a fork to allow for steam to release during baking. Bake in the preheated oven for 25 minutes. Remove and let cool slightly on a wire rack while preparing the other two layers. In a microwave safe bowl or glass measuring cup, combine the caramel bits and cream and microwave for 1 minute then stir to melt completely. 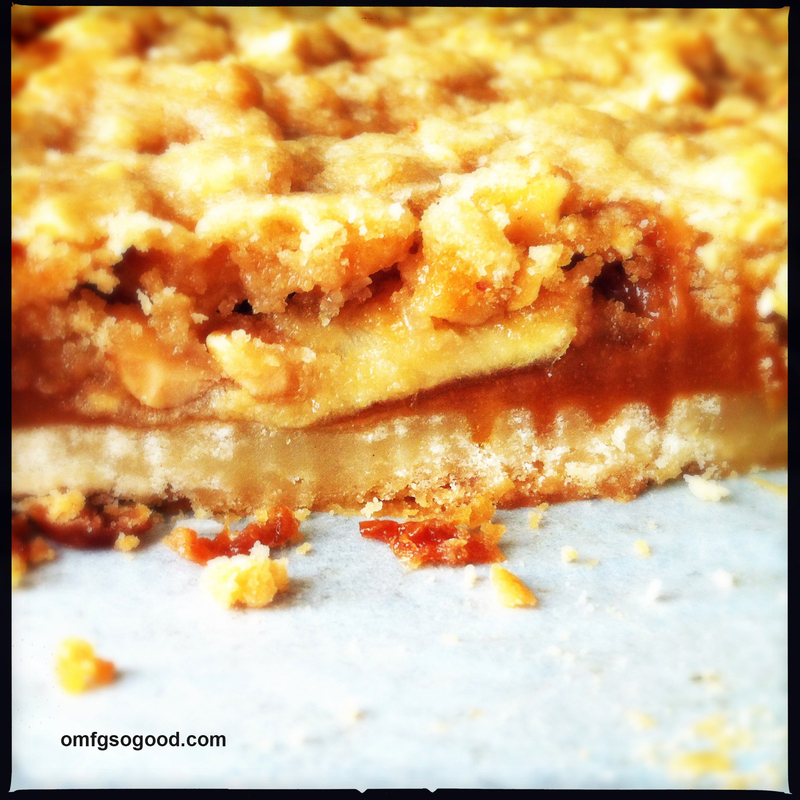 Pour the caramel over the shortbread layer and smooth evenly with an offset spatula. Sprinkle with fleur de sel then arrange the peeled, sliced apples on top. To make the crumb topping, whisk together the flour, baking powder and baking soda. Add in the brown sugar and peanuts and stir together with a wooden spoon. 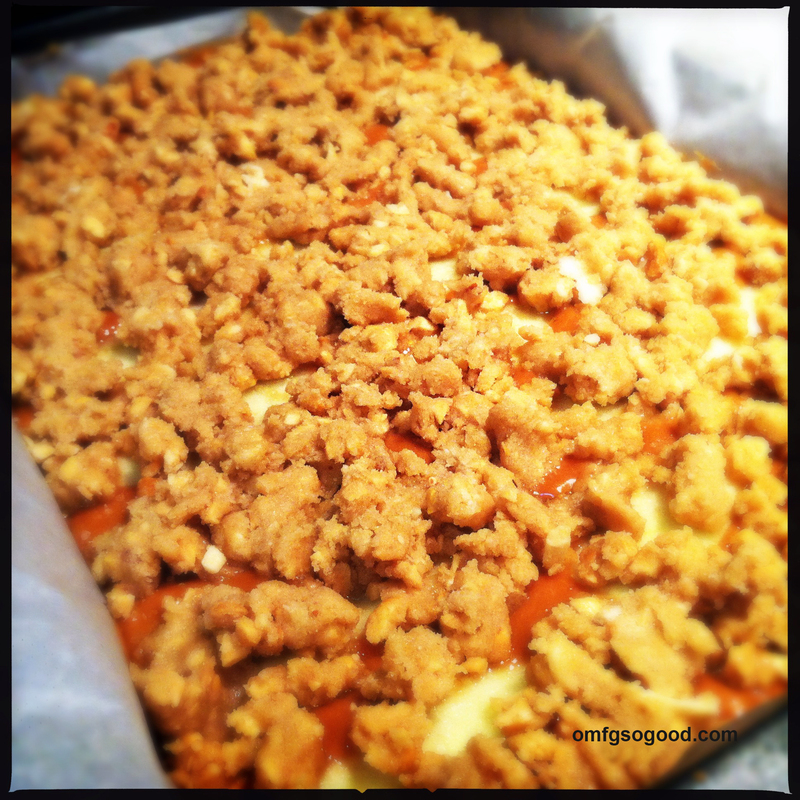 Add in the butter cubes and mix together with the wooden spoon (or your hands) to form loose crumbs. 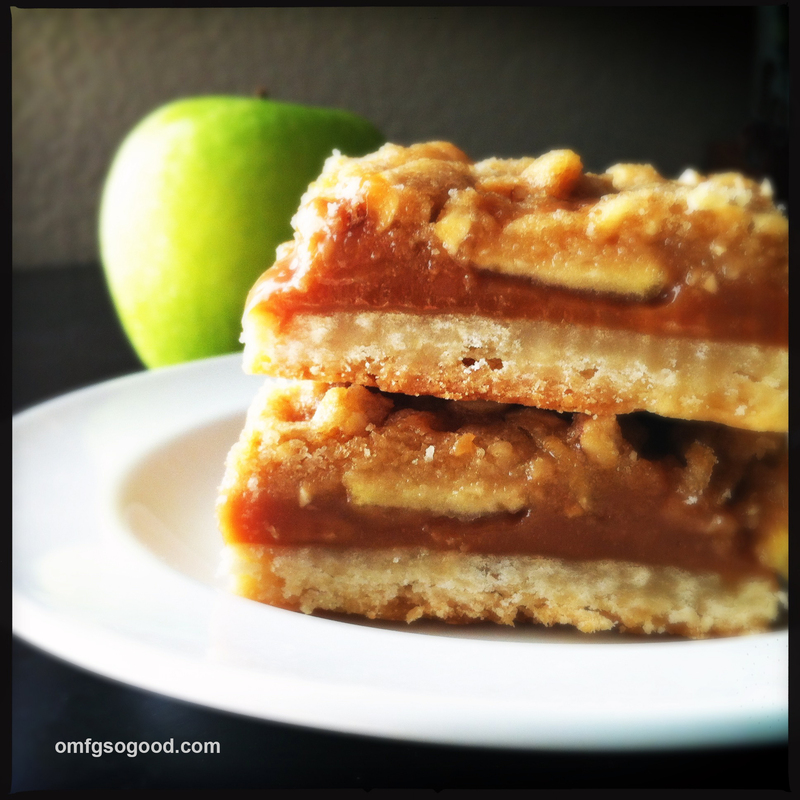 Sprinkle the crumb topping over the caramel apple layer until evenly covered. Increase the oven temperature to 325 degrees and bake for another 25 minutes or until the crumb top is golden brown, rotating half-way through. 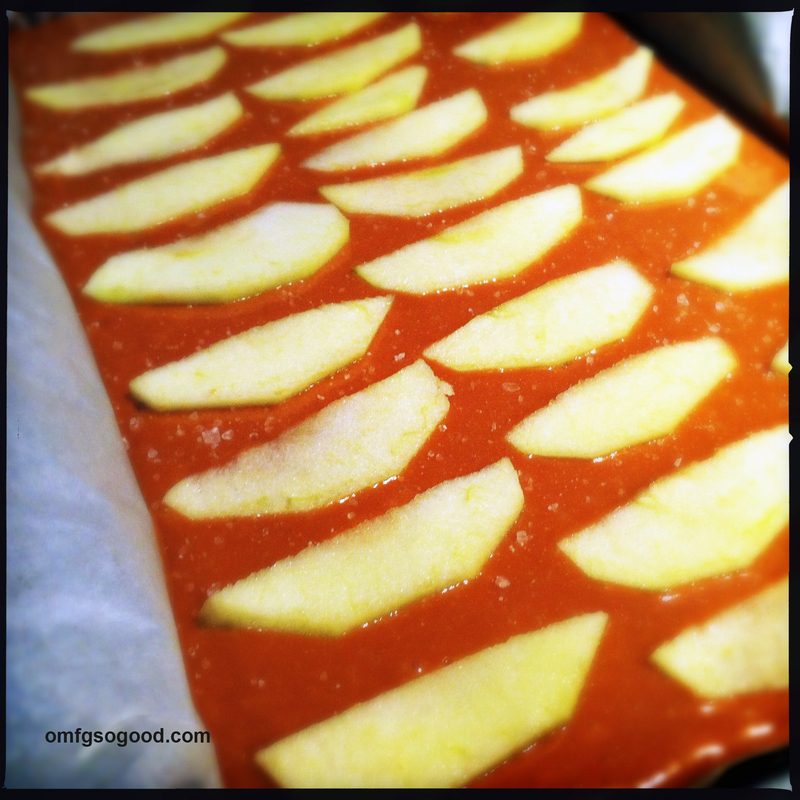 Remove from oven and allow to cool completely before cutting into squares. I actually made these on Saturday night (hence the dark photos) and waited until the morning to cut them up and the caramel had set perfectly. 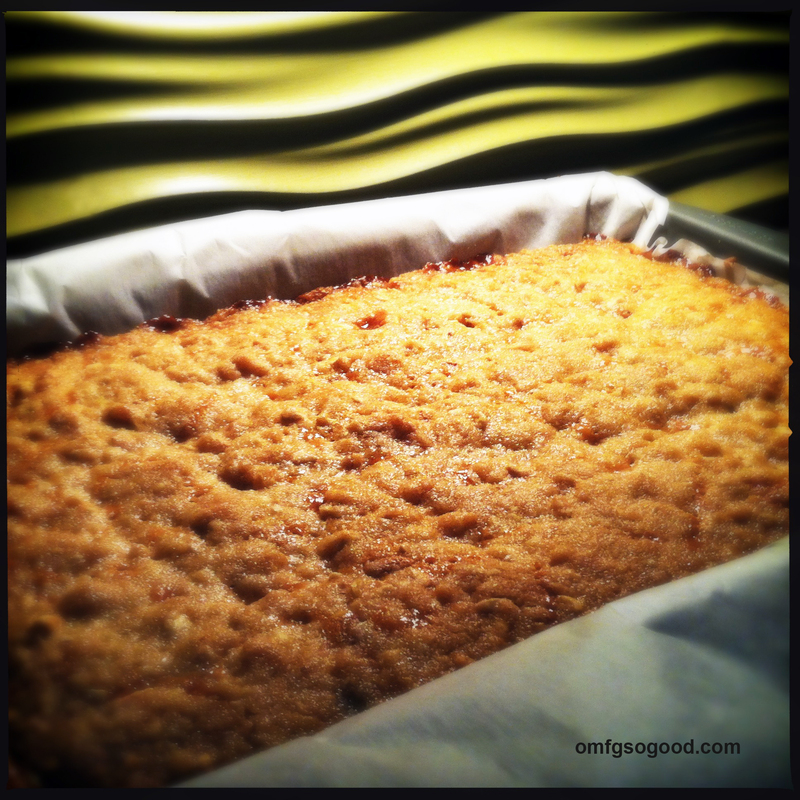 Okay, okay… Baby Daddy and I may have snuck a corner piece after the beasts were in bed. It just made watching the entire season three of Community on DVD that much sweeter. I do love me some Joel McHale. Almost as much as I love me some caramel apple. There is so many things to say to this, but I will settle on the eponymous omfg. so good. If you know me, then you know that I love a good sweet and savory combo….like this salted caramel apple recipe that looks OMFG so good! I try not to bake because I have a sweet tooth, but no willpower- deadly combo. I might have to break down for this one! Just re-blogged this. I love a good sweet and savory combo! OMG – that looks amazing! This is what my dreams are made of! I am drooling on my keyboard again!